One Time Service Call Fee $50! Never Pay another Service Call Fee at that Location! Don't let your heating and cooling problems get out of hand. Call for residential air conditioning and furnace repair services from SuperTec Heating & Cooling. Telephone Consultations and Troubleshooting is FREE. Do it Yourselfer calls are welcomed! If you're stuck, give us a call, we're happy to help. Receive complete troubleshooting services for your Residential Furnace, A/C, or Heat Pump System. Our technicians are highly trained to evaluate, test and properly diagnose residential heating and cooling equipment performance and operation. 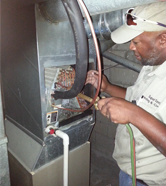 If you need furnace repair services, dont hesitate to call. Our solitary goal is to provide solutions that make sense and best serve our customers long or short term goals. We service all major brands (not limited to below list) and use OEM parts only. From programming your thermostat to your system switches to your system intergrated circuit boards to system fault codes to your high and low voltage wiring, our technicians have you covered. Your service call fee is a one-time charge that is specific to your property address. Our fees are $50 daily and $100 Sundays and after 7:00 p.m.
R-22 charging is $75 per pound. Our R-410A charging is $45 per pound. Contact SuperTec Heating and Cooling, Your HVAC Pro in Columbus, OH to schedule a Service Call or to answer your Residential HVAC or furnace repair questions.